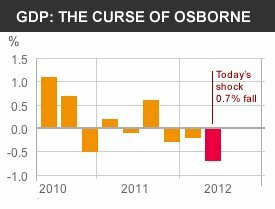 The 0.7% second-quarter fall in GDP in 2012 brings a calamitous verdict on George Osborne’s policy, with the UK economy now smaller than it was in 2010, and double-dip recession longer than in the 1970s. The latest bad news on the economy will surprise no-one (I hope, other than your average BBC journalist). Isn’t it time that we adopt the line that all the talk of cutting spending to lower borrowing, to cut the deficit and lower the national debt was, and remains, a simple lie? Who in their right mind could fail to see that sucking billions out of the economy could have any other impact than shrinking the economy, lowering revenue from taxation and increasing costs through higher welfare payments (even if these are being cut)? And what do we see now – rising borrowing, a deficit that is not being cut and debt that is not being paid off! In 1997 Labour inherited a national debt (as a % of GDP) lower than that seen in 2010, so the narrative that “all the money has gone” was always nonsense. It was and remains a simple pretext for the demolition of the public sector, the NHS, pensions, welfare programmes, anything and everything that has been gained through struggles going back generations. The Tories are our ‘Tea Party’ who are capable of delivering one thing and one thing only – blind ideological obedience to the interests of large corporations. The “cutting too fast and too soon” line has won us no friends – quite the opposite, I would argue. It’s time we put the case for investment, for growing our economy, for delivering the new jobs, homes and for better public services so desperately needed now more than ever. To do anything else risks the unkindest cut of all – a reduction in voter turnout and growing voter antipathy to the whole process. And we all know whose interest that serves. It’s time to change the record. Cuts are not the answer – well, they are but the question is not how we make sure we can live in a fair society, where people pay their way, get support when it’s needed and the interests of the many come way ahead of the private profits of a few. Time to leave the Eton mess behind. Time to give people hope that a real alternative exists. We are fed a lot of nonsense about ‘there being no money left’. This is a complete misunderstanding about the fundamentals of money and taxation. There is no limit to government spending other than in its capacity to cause inflation if the UK is operating on full throttle .. but at the moment, the real fear is of deflation, and there is plenty of spare capacity in the economy with the current high levels of unemployment. This lack of inflationary effect is evidenced by the fact that £325 billion of QE has had little impact. Labour should be aiming for full employment, not only by investing in a new green deal but also by lowering the pension age and shortening the working week. A new green deal could be aimed at reducing energy demand and boosting renewable energy production. This would create new jobs, apprenticeships, new manufacturing, which in turn would cut the benefits bill, raise tax receipts, create demand and reduce the structural deficit. The UK desperately needs more social or council housing to be built, and this offers the perfect opportunity to provide sustainable homes, with heat/water conservation measures and the capacity for the microgeneration of renewable energy. Furthermore, a mass insulation programme of the existing housing stock would cut ordinary people’s heating bills and, with the declining cost of renewable energy, their electricity bills. It would reduce cold-related illness/deaths, cut climate-changing gases and mitigate oil dependency. On a political level, it would usefully break the power of the big six energy companies, who currently hold government to ransom over the development of renewable energy sources. Steve Keen’s debt jubilee is an ingenious solution because it would both massively curtail the casino arm of the banks whilst also relieving the enormous debt problems of individuals/small businesses and creating demand in the economy. Labour must abandon ‘too far and too fast’. There is no rational argument for even a partial programme of austerity. It doesn’t make any sense. So why not? Saving Osborne’s face? Never under-estimate politicians’ vanity, but no Cabinet will hang on to a loser. But caught between the markets still demanding death-defying cuts and the IMF now on the side of growth, Osborne can still Houdini-like find a way through. With no increase in public borrowing, launch a big jobs and growth programme, funded by taxing the near-half trillion pounds amassed by the top 1% in the last 3 years. We need investment in a new green deal, in new housing, to create employment and to fully nationalise (at least) the bailed-out banks. This entry was posted in Economics, Environment, Opinion, Party Organisation, Topical News and tagged Big six energy companies, Cutting too Deep, Debt Jubilee, economy, George Osborne, Green New Deal, Labour Party, Michael Meacher, Recession, Renewable Energy, Steve Keen by adminthinkleft. Bookmark the permalink.